Over the last weeks I wrote a mysql-proxy which changes the way you operate with the MySQL Server. Some of them are already implemented, some are only ideas for the future. Using the admin server you can implement the functionality in a way that every mysql client (php, jdbc, odbc, perl, ...) can execute them. But we can use EXPLAIN for something else ... Index Usage. Up to now the MySQL doesn't expose any statistics on the index usage. Knowing which indexes are used gives an idea which indexes are maintained, but never user. Dropping them would increase the INSERT/UPDATE/DELETE speed. The key column tells us the used index. By maintaining a list of used index and mapping it against the available indexes you can see which of them is used most how often. For UPDATE and DELETE statements you can usually rewrite them into SELECT statements to make them EXPLAINable. Load Balancing selects one backend out of a set of backends to be used as mysql-server. We use SQF (shortest queue first) to distribute the load across the backends equally. Each backend will get the same number of connections. As long as the first host is up, it will be used for all queries. partially implemented The state of the slaves is checked every few seconds to track the availability and the delay of the slaves. If the slave is unreachable or far behind it is taken out of the proxy-pool. This is an simple check if the slave is up to date or not. If the update is executed it the end of each transaction we can track the progress of the replication based on the transaction level instead of byte-level (master_bin_log_pos) or time-level (seconds_behind_master). Thanks to the statement injection we can inject this into the normal stream of operations transparent for the application. We try to keep it free of side-effects. As a small side note: all the above features are implemented through a embedded lua engine. not implemented yet. Load Balancing isn't implemented yet, but will allow to all applications to utilize a connection pool which is maintained by the mysql-proxy. It will reduce the setup time for connections a bit. 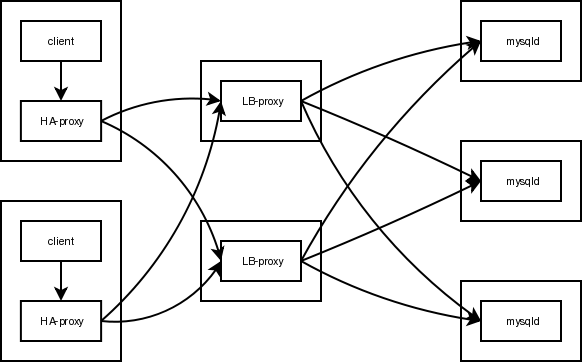 with the connection pooling the connections between proxy and server are kept alive and are only reset when a client disconnects. The proxy keeps a small pool of connections open and the initial hand-shake is answered without talking to the server. Depending on various factors we might be able to shadow the cost of a connection-setup. Based on the connection pool we can use a single MySQL connection can multiplex multiple client connections against it. As long as the client is only using stateless SQL statements we can send the queries across any of the available connections we have active in the pool. This has the neat benefit that we can maintain a lot more connections to the client than we use to the server. ... and similar the connection gets a state and we can't use it for balancing any more. As automatic detection of such statements is tricky and will fail any we will add a command-line option we just gives the option to the user to allow multiplexing of client connections. We will maintain transactions and LOCKs, but all other statements should just not be used in multiplexing mode. not implemented yet The proxy could change transactions in the way they commit against a server. For HA reasons you might set up two masters which both get the same statements at the same time without using the mysql internal replication. By replacing the BEGIN with a XA START "trx_name" and the COMMIT by a XA END ..., XA PREPARE .. and XA COMMIT we can use the two-phase commit support by innodb to commit a transaction against two or more databases. This is giving the application synchronous replication for free. The proxy can also operate in a reverse mode where it receives the statement as a replication client. It allows the proxy to track all statements which cause a change to the DB objects in the server. including time-stamp and user-name (if available). Base on this information you can track changes on your DB-objects, versionize the schema automaticly and build a DDL-diff. Username repl, No password. The password-scramling isn't implemented yet. not implemented yet. Similar to a MySQL server with blackhole is default storage engine a proxy can forward the binlog to multiple mysqld-slave with a lot less load than a full mysql-server.